Martha Pettigrew was born in 1950 in a small town in Nebraska. Martha received her B.F.A. in printmaking and painting from UNL in 1972. After graduation, she worked for the Nebraska State Museum creating scientific illustrations, but she left after six years because of the lack of creative input she was able to put into her work. In 1978, Martha married Delmar, and together they started a business raising and training thoroughbred horses. However, with an abrupt shift in the market, the farm went bankrupt. With $37.00 in their possession, Martha and Delmar decided that Martha’s artistic talent could relieve them from their financial troubles, and they left Loveland, CO. The inspiration behind most of Martha’s work is the Native American woman at the turn of the century. Martha’s sculptures are narrative, and many portray Native American women in idealistic ways. As Martha states, “Women are the culture bearers in every society, they do most of the child-rearing, and that is how culture is passed along. 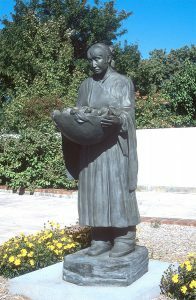 The routine activities they perform such as hauling water, baking bread, and teaching children are the things that perpetuate a society.” Martha’s sculptures, in few words, express strength, dignity and serenity. Their faces speak thousands of words and are generally the focus point of the piece.